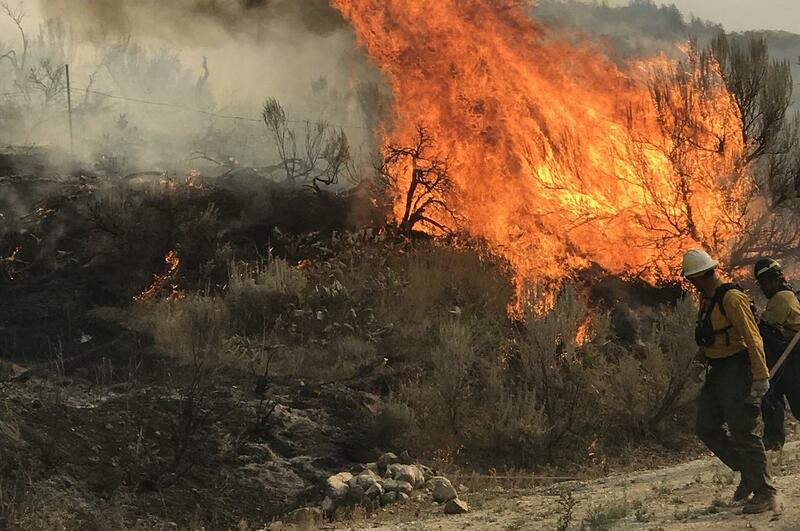 CHELAN, Wash. – A wildfire near Chelan has slowed down thanks to overnight rain, though officials warn that evacuation orders remain. Douglas County officials said on Twitter Saturday that the Chelan Hills fire has burned about 2 square miles. They’ve reopened Highway 97 after shutting down 22 miles of it. County officials say evacuation orders are unchanged from the night before, when it was mandatory for the Chelan Hills area. There were lesser evacuations in place for McNeil Canyon, Beebe Park and Lone Pine areas. McNeil Canyon and the waterways remain closed. Officials say an unknown number of structures have been lost or compromised. Approximately 50 homes are under Level 3 evacuation notices, meaning residents should leave immediately. 200 firefighters are working the fire. The fire began Friday afternoon at about milepost 233 on Highway 97 just south of Beebe Bridge. It’s burning in sagebrush, grass and wheat. Published: July 28, 2018, 11:34 a.m. Updated: July 28, 2018, 5:03 p.m.